Last month, I did a guest post for Chef-in-Training and today I'm sharing the recipe with you! 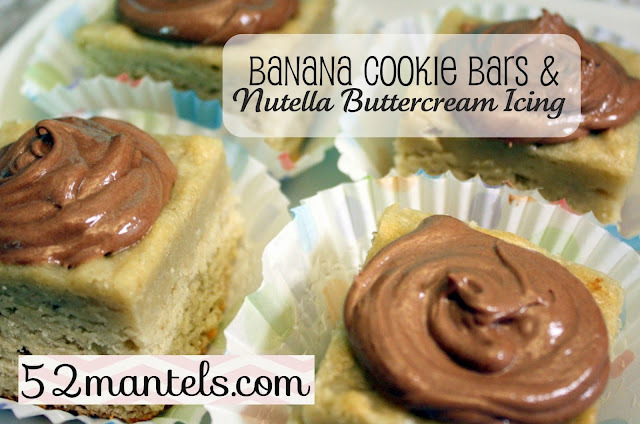 This yumminess was inspired by one of my favorite flavor combos: Bananas and Nutella. Delicious! 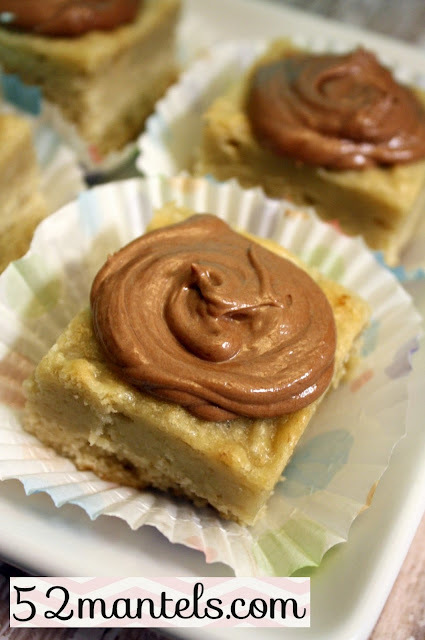 I adapted this recipe from a basic sugar cookie bar and added my own icing. Cream butter and sugars. Add egg, beat well and then add banana and vanilla. In a separate bowl, combine flour, salt and baking soda. Slowly add the dry mixture to the wet mixture, using the lowest speed on your mixer. Place parchment paper in a 9x13 pan and spread mixture evenly over pan. Bake in a 375 degree oven for 25-35 minutes, removing when the center sets. Cream butter with nutella and then slowly add the powdered sugar. Add milk slowly, until desired consistency is reached. Can I be honest? When I make dessert to serve at a party, my first thought is always on presentation. I like to serve easily displayed, easily grabbed, easily eaten desserts. In the past, when I've sliced up a batch of iced cookie bars, though tasty, they always ended up...disheveled. (If you know what I mean). So, when I made this cookie bar, I cut them up BEFORE icing them. Radical, I know. The result? 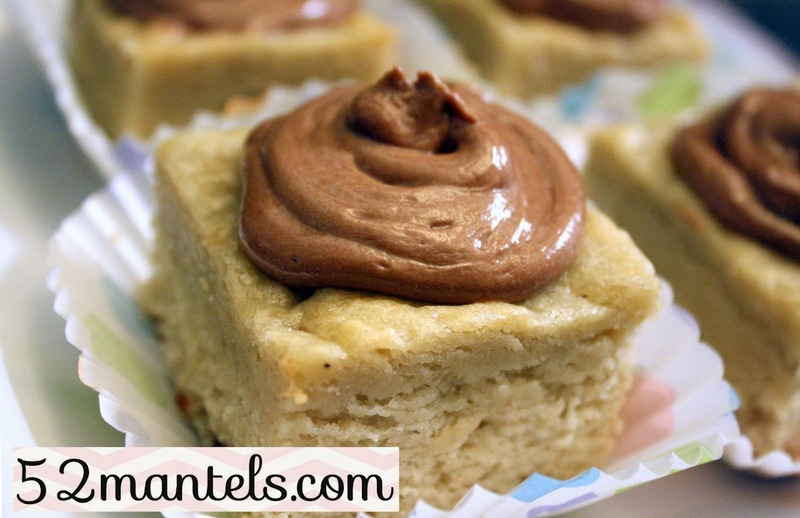 Yummy banana cookie bars with perfectly placed Nutella buttercream icing! What's your favorite way to eat nutella?? Totally drooling! I eat Nutella any way I can! Oh my, I'm in love...I have to try these. Totally Pin-worthy! This looks so tasty!!! You really can't go wrong when bananas and Nutella are involved. And you're completely right -- these would be so handy to bring to a party. Love these! These look amazing, Emily! My kids are addicted to Nutella and I always have over-ripe bananas. This is a match made in heaven!! Oh these look delectable!!! I love Nutella... pinning these now! Yum - Nutella!! Oh how I love it so - but my girls are allergic to tree nuts!! (oh well, I can make it for me)! I love nutella. When we were in Paris, they make fresh crepes with Nutella and bananas... it's a hot mess, but oh so good! These are beautiful and look delicious.